“I know that one day I’ll kill myself, because I don’t know how to stop feeling this way but it won’t be today. Having spent a lifetime hating herself and struggling with post traumatic stress, her gender identity, self harm and suicide, RAF veteran and former motorbike racer, newspaper editor, Premier League football and rock photographer, Sophie Cook was at breaking point when she transitioned from male to female in 2015. 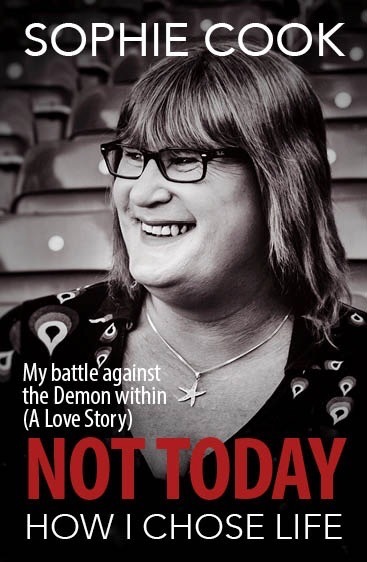 For the first time ever Sophie tells the full inspirational story of how she conquered her demons to come out as transgender in the Premier League, run for Parliament and learn to love herself. ’Not Today: How I chose life’ charts Sophie’s personal journey from despair to redemption and acts as a self help book for anyone struggling with their mental health and identity.